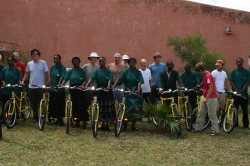 Fifty-nine bicycles were donated to Community Based Organisations around Kabwe, Zambia. Care Workers are now able to visit those in need in their community more often and when needed use their bikes to transport patients to the clinic. They used to have to walk long distances especially to the most vulnerable who are often located on the fringes of communities, now they are overjoyed with this gift from Tour d’Afrique.